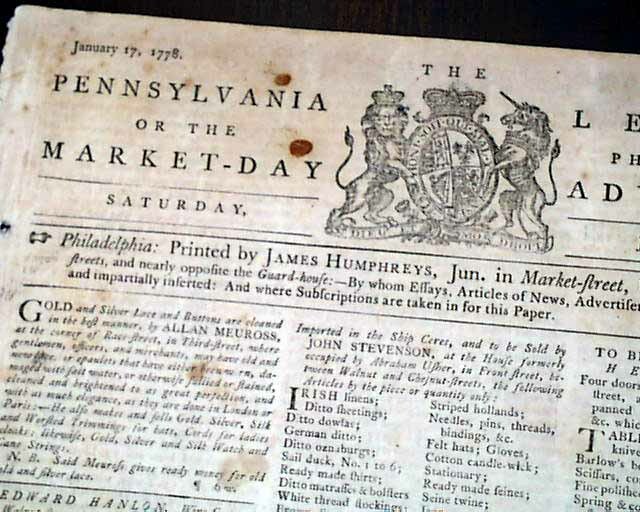 This was a Tory newspaper published in Philadelphia when the British occupied the city. 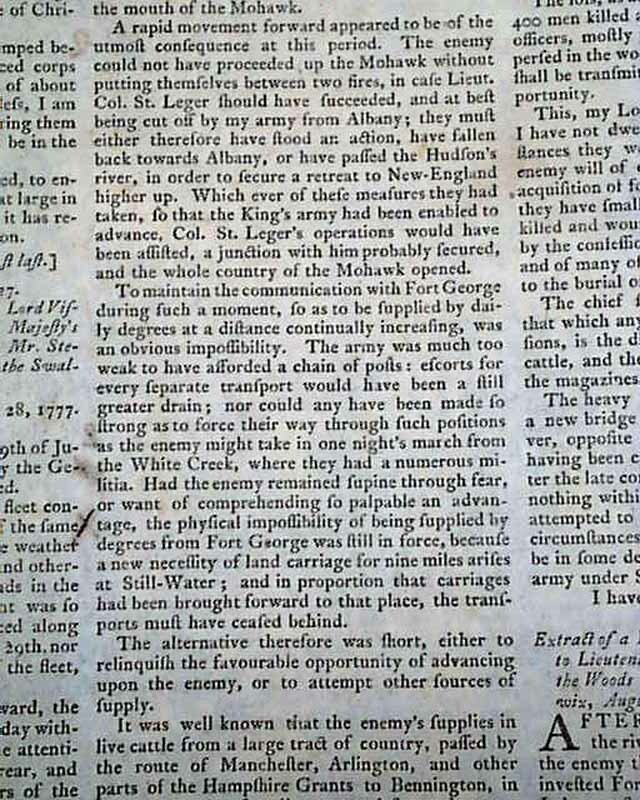 It began in 1775 and ended when the British evacuated the city in May of 1778. 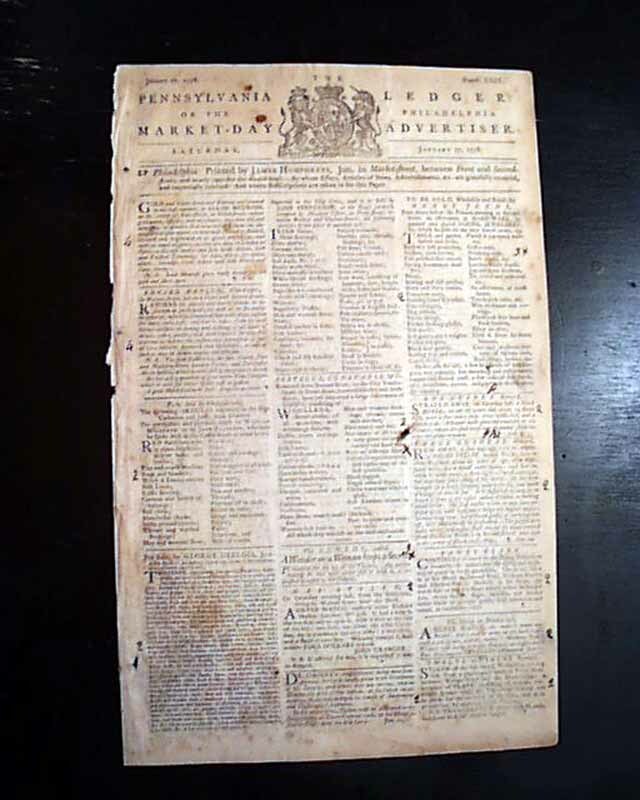 Not surprisingly, the masthead features an engraving of the Royal coat-of-arms. 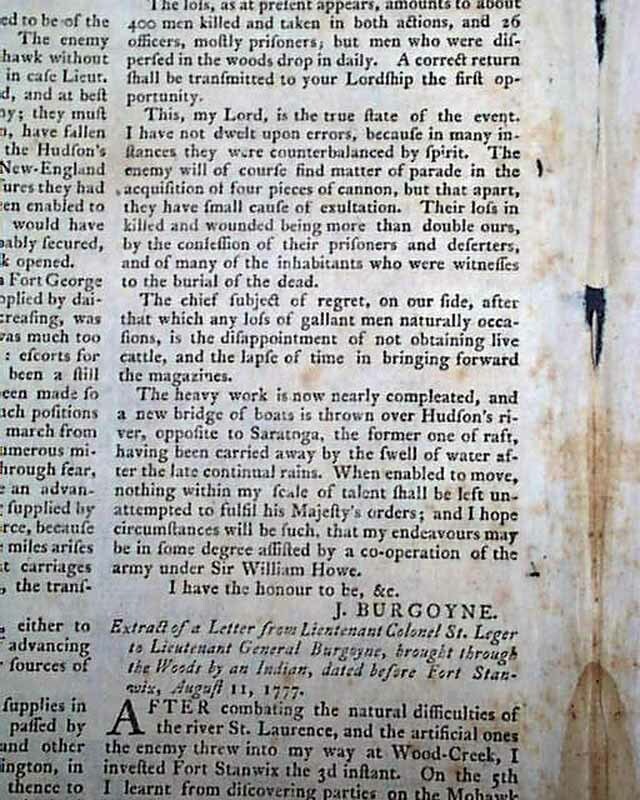 Page 2 has a great account of the Battle of Bennington, being a nearly half page letter signed in type by the losing commander of the British forces: J. Burgoyne. See the photos for the details. The letter has near the end: "...This, my Lord, is the true state of the event. 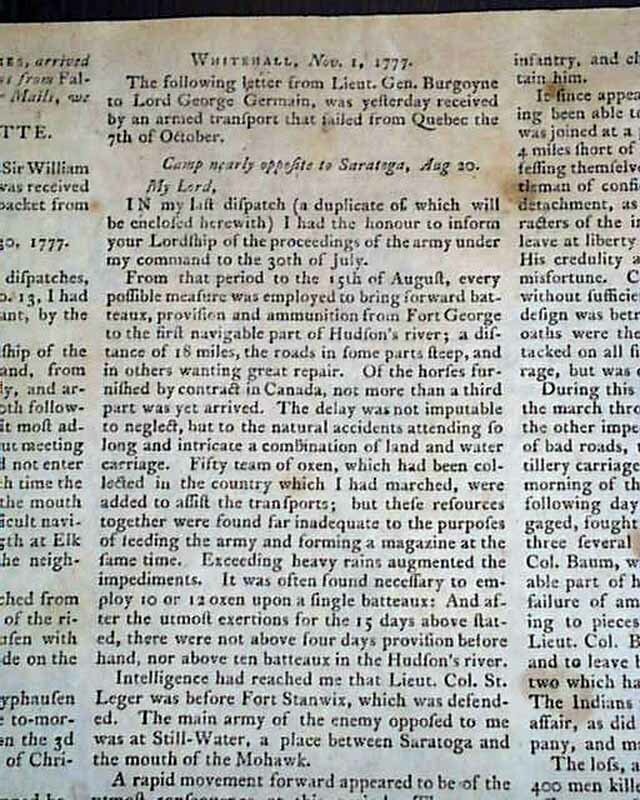 I have not dwelt upon errors...The enemy will of course find matter of parade in the acquisition of four pieces of cannot, but that apart they have small cause of exultation. 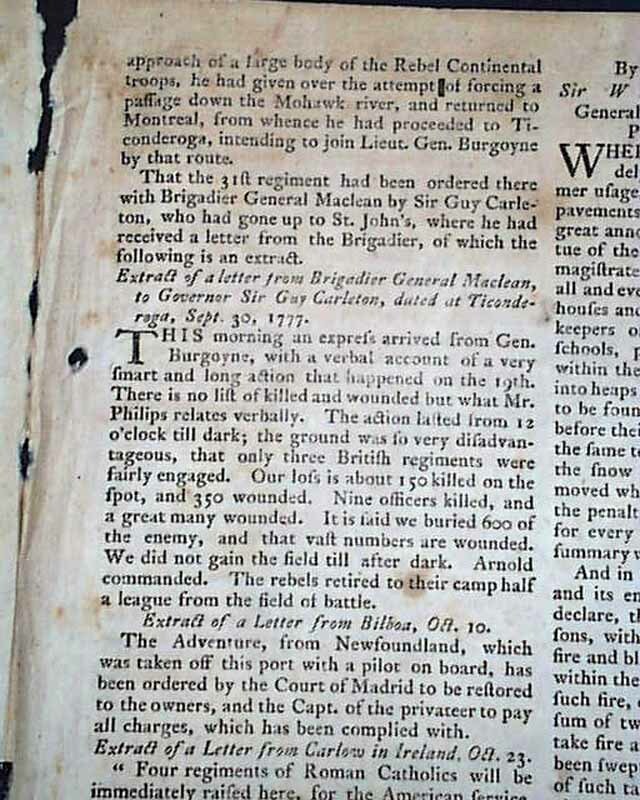 Their loss in killed & wounded being more than double ours..." with more. 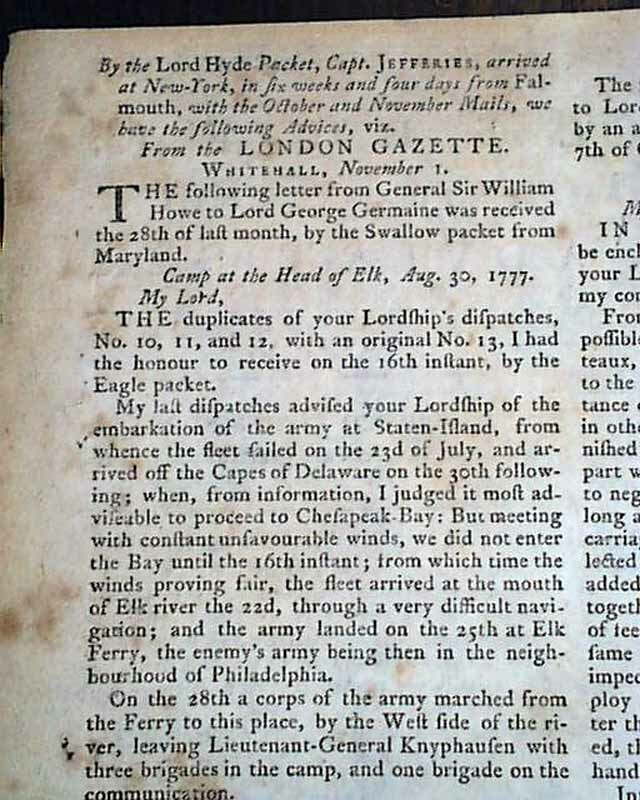 Page 2 also has nice letter from General Wm. 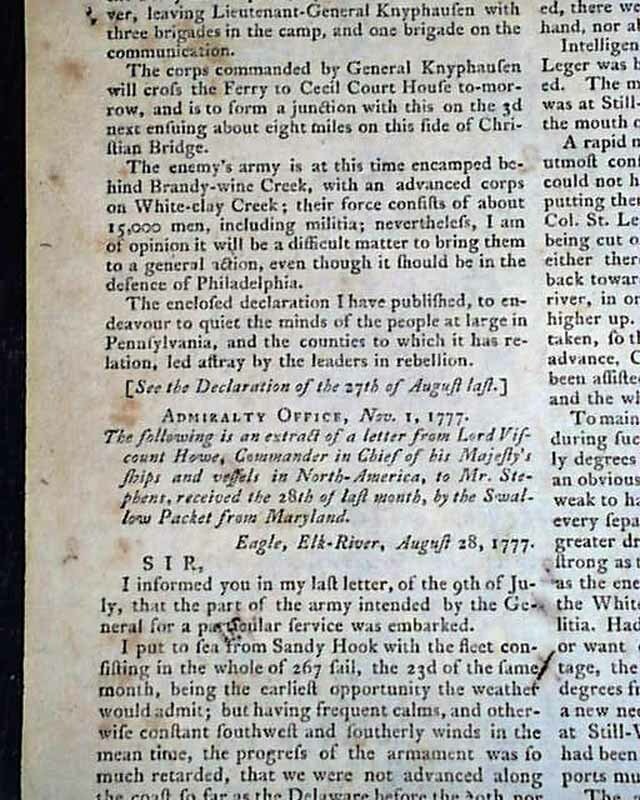 Howe, commander of the British forces in America, concerning his actions near the Chesapeake Bay. 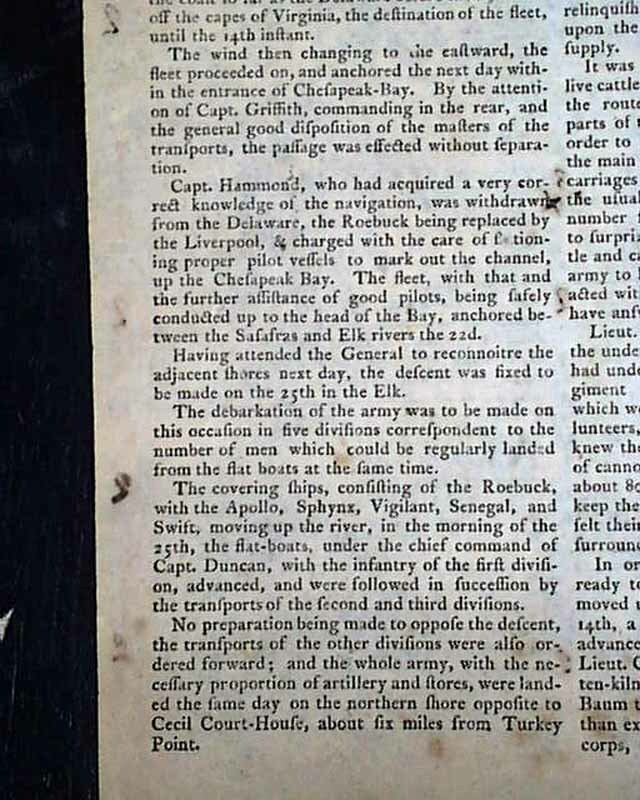 This details his sailing south from New York and moving up the Chesapeake Bay and landing at the Head of Elk on August 25, 1777. 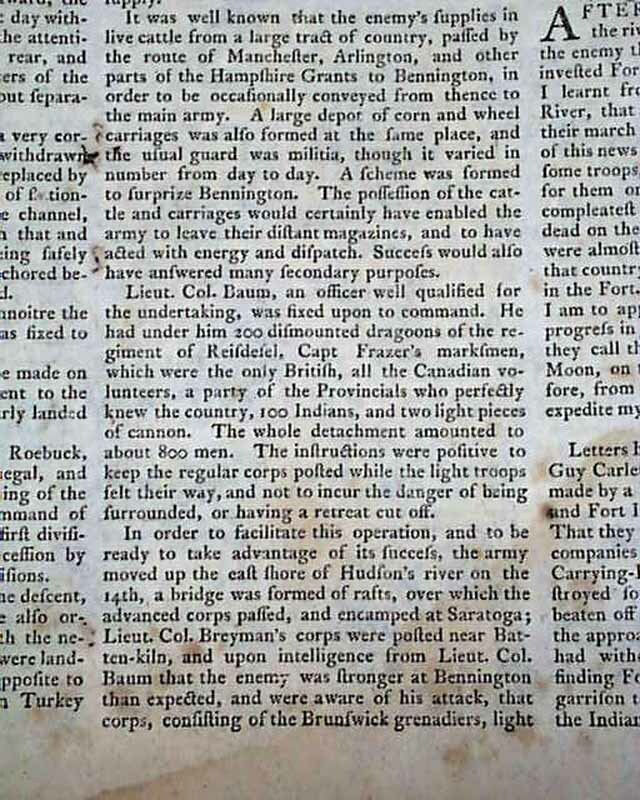 A few weeks after this move Howe would defeat Washington at the Battle of Brandywine on September 11. 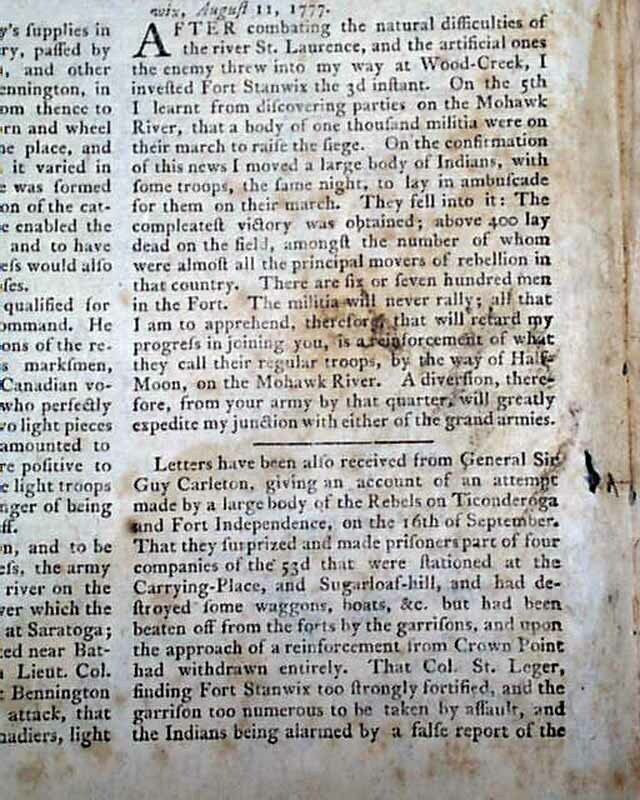 A terrific wealth of war-related content, as pages 2 & 3 also include a letter from Lt. Col. St. Leger to General Burgoyne dated at Fort Stanwix, and a letter from General Carleton concerning an attempt by the Americans upon Ticonderoga, and a letter from Gen. MacLean to Guy Carleton dated a Ticonderoga, plus even more. 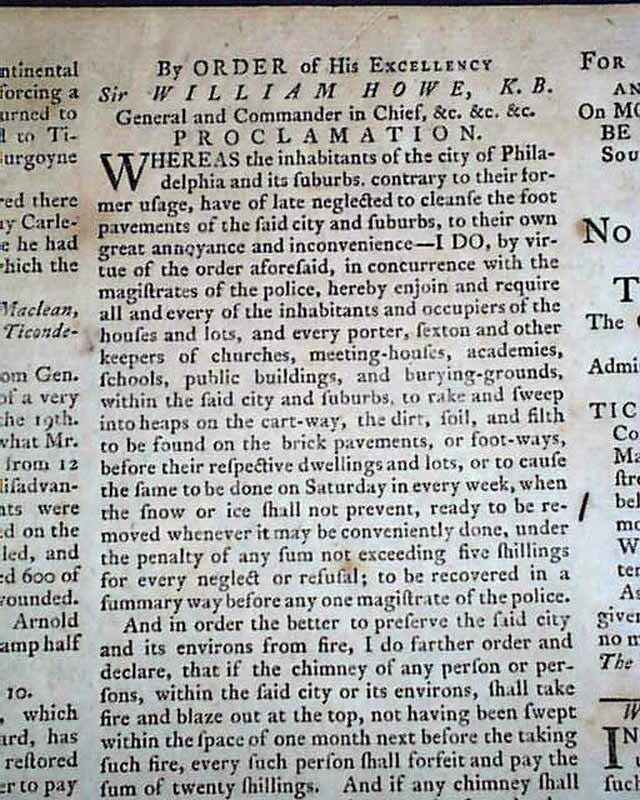 There is also a "Proclamation" by William Howe concerning efforts to preserve the occupied city of Philadelphia. 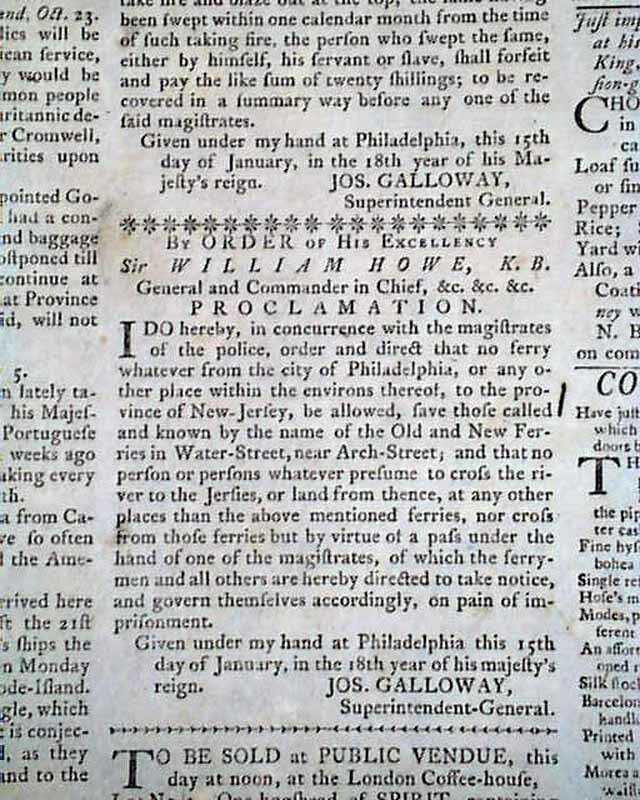 Yet another 'Proclamation" by Howe as well. 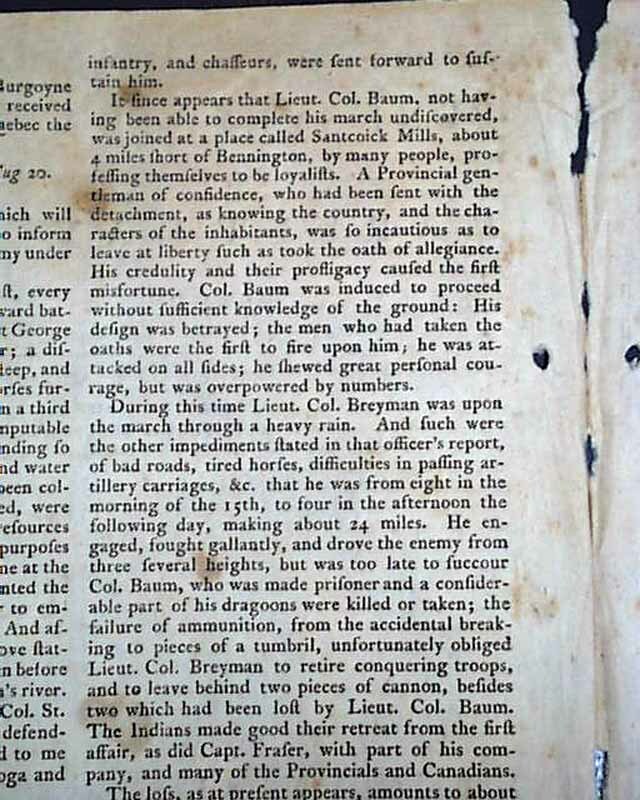 Four pages, light water stain to a lower corner, various numeric notations in margins next to ads (this was the editor's copy), generally nice condition.